Turquoise is not my favorite color. It’s not even a color that shows up in my personal color wheel. For the longest time, navy blue was more my speed. It’s a dark color, blends in well, doesn’t stand out…fits me perfectly. Over the years my personal color wheel has filled with more reds, grays, greens, more blues, and even purple. In having a daughter, pink began to flicker in, but turquoise has never been on my radar…that is until last summer. 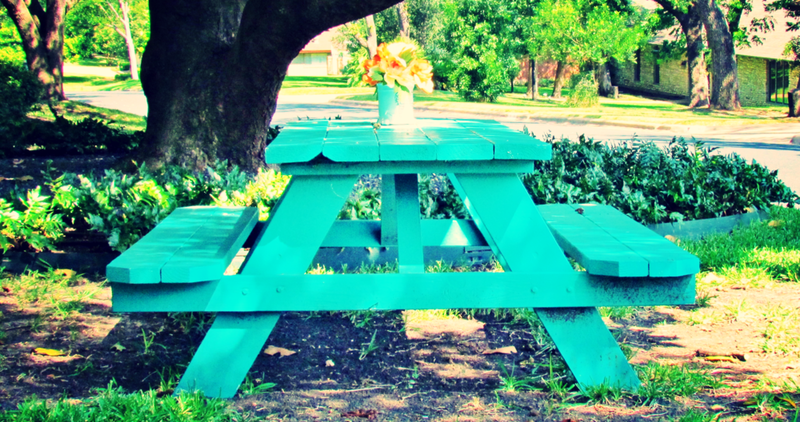 While turquoise is not my favorite color, it is the favorite color of author Kristen Schell, who painted a picnic table turquoise, placed it in her front yard, and then wrote a book about it. Turquoise is most definitely her favorite color. While turquoise is not my favorite color, it has come to represent activity in my life that has become something that is very much my favorite. Last summer, as Village Crossings was looking at the ministry of Jesus, we were exploring the statement Jesus makes of “love your neighbor”. It’s a phrase we are more often familiar with than not, but what does it really mean? The question that follows is “Don’t I have to know my neighbor to love them?” This is where the book “The Turquoise Table” by Kristen Schell enters in. It is a quick read about a turquoise table and just simply connecting with those who pass and sit at your table. She made it sound so simple and I was ready. We wanted to know our neighbors and this seemed fairly simple. By the end of the book, we were buying a table and painting it turquoise to place it in the front yard (even with a neighbor that was completely perplexed by it and most likely thinking “there goes the neighborhood”). So there it sat, our expectations were low, but we were willing to give it go. Kristen Schell speaks of just taking time to sit at the table, to be present and aware. We made a decision that for at least 10 minutes a day, we would sit there, weather permitting. What unfolded over the summer and fall were conversations. People stopped to talk at the table, some even stopped to sit. We truly began to meet our neighbors, know our neighbors, and love our neighbors. I can think of very few times where we have sat at the table and had no one stop to chat, even for a bit. I could very easily say it’s the power of the turquoise table, the color just begs for someone to notice and to stop, but to stop there would miss the big picture of what is occurring. In human life, we have 6 basic needs: certainty (safety), significance, variety, connection, growth, and contribution. The first four are said to be needed to survive and need to occur daily. We need to feel safe, we need to feel we are seen, we need to feel challenged or excited, and we need to feel connected/togetherness. I truly believe that when people stop at the turquoise table, it’s because those four needs are met, whether that is their intention for stopping or not. The conversation is never loaded and typically starts with a safe “How are you?”. The other person feels seen because it’s hard not to look at the person you are sitting across from. There is a feeling of excitement from meeting from a variety of people and also connecting with someone. Jo Saxton says “You cannot be what you cannot see.” I cannot be hopeful, unless I see hope. I cannot be loving, unless I see love. I cannot be peaceful, unless I see peace. I cannot be connected, unless I see connection. Very few times, do I know how the other person across the table feels when they leave (we don’t survey them as they go). They may not even think twice when they walk away from that conversation and table. But what I can be for certain of is exactly I feel. I have more days than I can count that I come home tired and frustrated, and Eric says “Let’s go to the table”. Inside, I am thinking “No, I don’t want to. I don’t feel it tonight. Let me be in my misery!” But I have gone because of the commitment we made to be at the table. Sure enough, someone will stop and conversations will occur. By the end of the evening, my tiredness has been replaced with energy, my frustrations have been replaced with hope. Why? Those 4 basic needs have been met: I feel safe, seen, excited, and connected. All of this from simple conversations about life, that vary from basic to in depth. All because of a connection from sitting at a table with someone. My prayer is that the other person feels the same. It’s very easy to look around, see the brokenness of the world, and feel like there is nothing you can do about it. But what the turquoise table provides is not just a pretty painted table, but a place for the ministry of presence which is what our world around us needs. It’s simply the ministry of seeing the person and listening to the person. It doesn’t involve training, it doesn’t involve relocation, and it doesn’t involve a starter kit. It involves simply seeing the person placed in front of you and loving them enough to be present, to care, and to provide some hope along the journey. It can all begin by simply sitting at the turquoise table and being aware of who God brings by. Come. Take a seat at the table this summer.